I also am most grateful for the efforts and wholly respect the sense of responsibility among all of those engaged in responsive measures to the accident, despite the risks and amidst the severe conditions at the Fukushima Dai-Ichi Nuclear Power Plant. 1-1. Reconsidering our energy policy over the past 10 years, when we chased after nuclear power generation trends under numerical limits of Kyoto Protocol. Energy policy for the past 10 years has rested largely on the numerical limits promised for CO2 emission reduction levels of energy sources set forth by the Kyoto Protocol. The promised levels presented three energy policy options: either highly burdensome energy conservation with new energy, nuclear power generation with assumption of risks, or purchasing of international emissions rights. If development and exploitation of nuclear power generation remains impossible for the foreseeable future and the promised levels of the Kyoto Protocol remain in place, meeting the promised levels will require highly burdensome energy conservation with new energy, or continued purchasing of international emissions rights. In other words, a policy of phasing out nuclear power generation requires a large, upward revision to promised levels under the current Kyoto Protocol, after discerning feasible energy conservation and new energy policy levels. In addition, phasing out nuclear power generation means greater reliance on fossil fuels with volatile prices. A reduced risk of nuclear power accidents will be replaced inevitably with a corresponding economic impact. A careful examination here is necessary. The supply of power, meanwhile, will become largely dependent on natural gas-fired thermal or diesel power generation. The situation in terms of environmental protection policy appears to be the reverse course. From a humanitarian perspective, however, blocking the recovery to energy delivery by bringing up environmental assessments or CO2 footprints is unthinkable. Unfortunately then, Eastern Japan for the next few years will face a priority in policy for steady energy delivery, while energy environmental policy will need to be temporarily frozen. The introduction of renewable energies to the affected areas is certainly beneficial from a long-term perspective, but forcing the use of relatively expensive energy on victims who have lost their household assets presents a concern, in that it may impede early efforts to rebuild their daily living, and should probably be avoided for the time being. When the newly devised safety standards are presented in light of the accident that occurred, if conformance to these safety standards proves technically difficult for nuclear power plants and the power companies hesitate on meeting them, the review of energy policy will be predicated largely on a policy of phasing out nuclear power. The realistic approach in this case would be to institute provisional yet thoroughly considered tsunami and earthquake countermeasures to existing nuclear power plants, and to decommission the nuclear power plants in the order of their age. Regarding the new safety standards, if many existing nuclear power plants do conform to the safety standards and the power companies actively respond, then the non-conforming nuclear power plants can be closed and decommissioned so that policy can return to advancing nuclear power generation under the major premise of assured safety. Caution is necessary here, however, since a moderate policy of freezing construction on new nuclear power plants may increase the risks. There is no rational reason to prevent the updating or replacing of old-model reactors. See the reasons below. 2. Fukushima Dai-Ichi Nuclear Power Plant accident and argument: Can the same accident be prevented at other nuclear power plants? Total power supply failure and reactor-core coolant water loss comprised the accident that occurred, caused by large tsunami that inundated TEPCO Fukushima Dai-Ichi. But a number of other, simultaneously tsunami-inflicted nuclear power plants did not suffer serious accidents. This fact merits attention. Securely equipped with external power supplies and emergency generators and vested with a certain level of countermeasures against large tsunami, Tohoku Electric Power Onagawa and Japan Atomic Power Tokai Unit 2 successfully completed cold shutdowns, although the magnitude and frequency of the invading tsunami were different. Despite insufficiencies in large tsunami countermeasures, TEPCO Fukushima Dai-Ni achieved an early recovery of external power supply and emergency repairs to cooling systems, and successfully completed a cold shutdown. Similarly, Reactor No. 6, which was a new model, and adjacently linked Reactor No. 5, which was old but unlike old-model No. 4 that was undergoing scheduled inspection work, successfully completed cold shutdowns within TEPCO Fukushima Dai-Ichi, even though the two reactor units reached critical conditions at one point before receiving accommodation and making a recovery from emergency power supplies. Citing response issues to a potential Tokai regional earthquake and tsunami, Chubu Electric Power took action without any direct relation to the tsunami this time, and had decommissioned old-model Reactor Units No. 1 and 2 at Hamaoka in 2008. 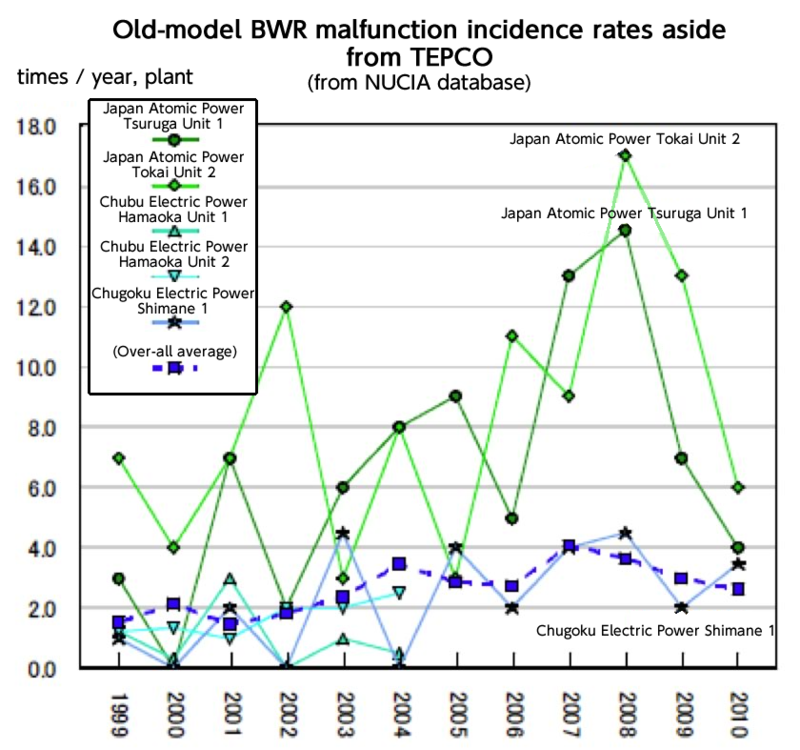 The above shows that some older-model nuclear reactors in operation for 30 years or more with insufficient countermeasures against large tsunami suffered a total power failure caused by tsunami of the magnitude experienced this time, and said total power failure led to the serious accident of reactor-core coolant water loss. For newer-model nuclear reactors operating for fewer than 30 years, securing and recovering external power supplies or emergency generators were successful, although the magnitude of tsunami and other conditions presented some differences. Importantly, even older reactors aged 30 years or more successfully completed cold shutdowns where appropriate, major tsunami countermeasures were deployed, or when emergency power was accommodated from adjacent new-model reactors. Observation of past incidence rates of malfunction at the respective power plants is beneficial when gauging the emergency-response capacity or damage-containment capacity for nuclear power plants in the event of an accident, because frequently in an emergency the slightest malfunction can induce a serious, irreversible situation. 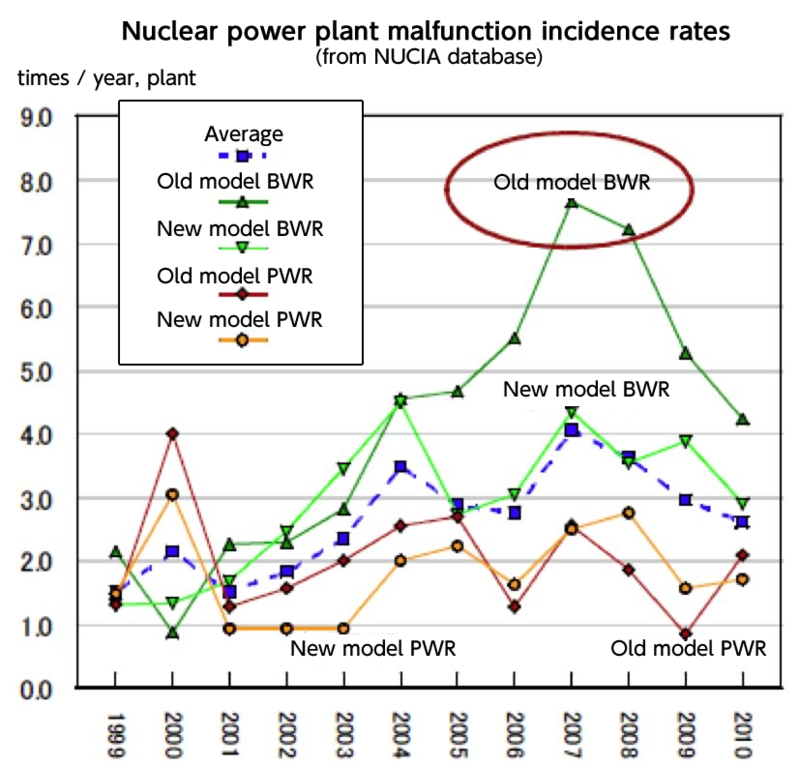 A comparison of malfunction incidence rates by reactor age and model between 1999 and 2010 in the database of the open library for nuclear power facilities (NUCIA) reveals that old-model boiling water reactors (BWR), such as Fukushima Dai-Ichi that sustained the accident, have recorded extremely high occurrences of malfunction incidence rates. 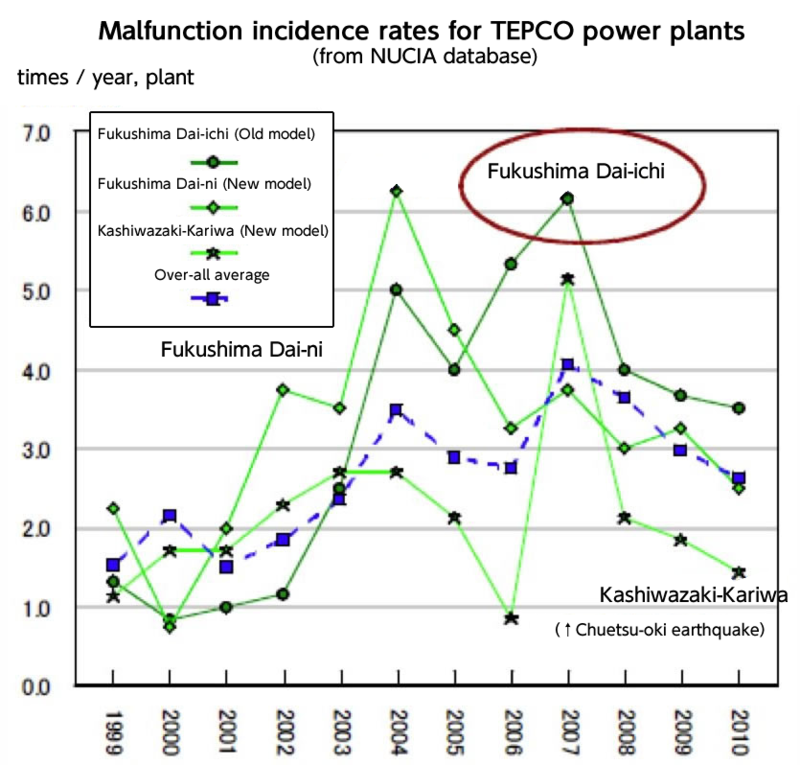 The malfunction incidence rates by power plant for TEPCO show that incidents increased severely for Fukushima Dai-Ichi and Dai-Ni since 2002. Subsequently, Fukushima Dai-Ni experienced a decline in incidences, but Fukushima Dai-Ichi tracked at a slight decline and remained high. Potential malfunctions at the site are speculated to have caused a drop in emergency-response capacity and damage-containment capacity. Moreover, large differences by power company and by power plant are seen. 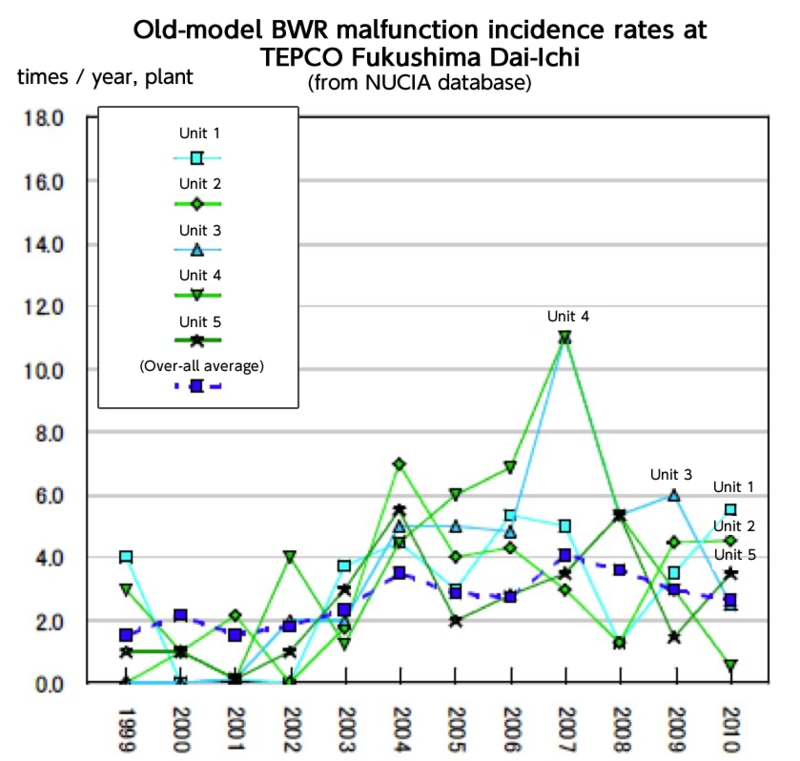 For the old-model BWRs, Tsuruga Unit 1 and Tokai Unit 2 of Japan Atomic Power have experienced significantly high occurrences of malfunctions, while Shimane Unit 1 of Chubu Electric Power tracked nearly at the domestic average. TEPCO’s Fukushima Dai-Ichi power plant has incurred malfunctions at a frequency exceeding the domestic average for more than the past five years. Potential problems are speculated as having existed in emergency-response capacity and damage-containment capacity when the accident occurred. This high incidence rate of malfunction is believed to be influenced by expenditures for the maintenance of nuclear power plants at TEPCO. According to Yuho filings by the power companies, maintenance expenses per unit nuclear power plant capacity from 1980 to 2009 increased from 2005 to 2009 at many power companies with measures addressing long years of service and earthquakes. TEPCO, however, held maintenance expenses relatively flat during this period. 3-1. Can the same accident be prevented at other nuclear power plants? We must wait for the scientific, objective, and validated conclusions regarding the accident, before a final determination of whether this accident was preventable or not. The situation on-site remains precarious, moreover, and future validation work will be entrusted with determining the appropriateness in the series of response measures initiated, particularly beginning with the introduction of seawater to the reactor core. As described thus far with respect to the facts surrounding the plant facilities, operations, and maintenance of the nuclear power plant, the author believes that if capital expenditures for seismic and tsunami countermeasures, such as withstanding flooding by the emergency generators, were not minced, and reasonable revamping expenditures for reinforcement of emergency-response capacity and damage-containment capacity were executed, a high probability of either avoiding the accident or vastly containing damage existed. 3-2. So, what was the problem? From the perspective of making business decisions on plant equipment matters, Chubu Electric Power made decisions to decommission or rebuild, and Japan Atomic Power decided to invest reasonable flooding countermeasures, but TEPCO seemingly made a decision to do nothing and gamble with the old-model reactor at Fukushima Dai-Ichi, despite seeing the responses made by other companies. 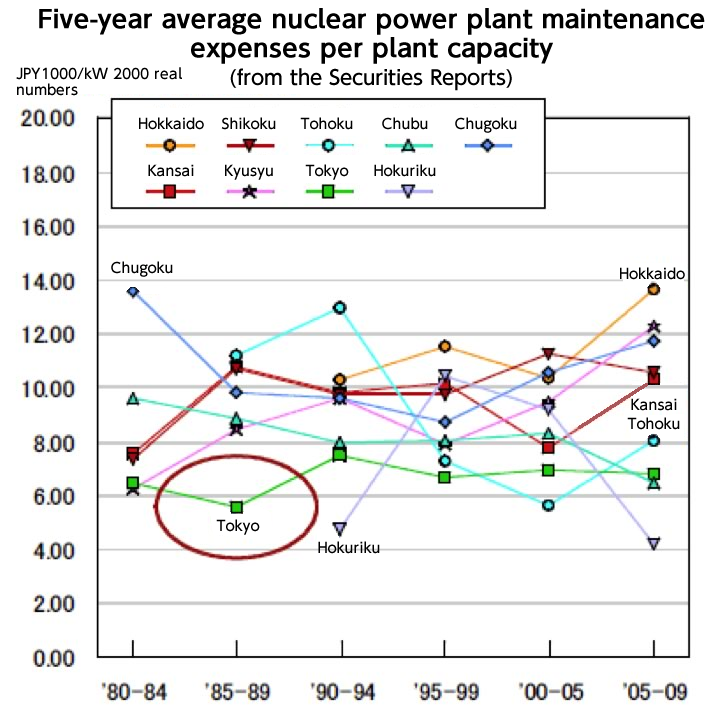 Similarly, from the perspective of business decisions in regard to operations and maintenance matters, many power companies increased their maintenance expenditures per nuclear power plant unit capacity, but TEPCO kept these expenditures constant year on year. Consequently, TEPCO invited a high malfunction incidence rate by impeding equipment updates and repairs at Fukushima Dai-Ichi and it is speculated that potential problems were quietly overlooked with respect to emergency-response capacity and damage-containment capacity. In response to this corporate decision by TEPCO over the past 10 years, another argument exists over measures to correct or improve this matter effectively and to secure safety among the regulatory authorities. 3-3. How should energy policy be studied going forward? Thus, if the new seismic and tsunami safety standards to be devised next can be applied rigorously under the new nuclear power safety organization and the power companies can take sincere action in response, the author feels that ample possibility remains for nuclear power generation to recover its trust in the near future, and for current “policy promoting nuclear power generation under the major premise of securing safety” to return. Restoring this trust, however, will certainly require a lot of time and effort, not to mention sufficient compensation to the people who suffered from the accident. The author does not consider returning to “policy promoting nuclear power generation under the major premise of securing safety” as the only option. Nuclear power generation is an effective means to deliver energy within energy policy, but not the purpose for the policy. For instance, policy to phase out nuclear power generation was studied as one option during actual discussions in 2001. As preparatory material for decision-making in choosing policy, various options need to be scientifically and objectively forecast and evaluated under the same premises for economic and social impact. In ultimately selecting policy, it will be important to weigh the risks of nuclear power incidents calmly against future economic impact under the new safety standards. I hope for the exercise of careful judgment in this matter. The operation of a megawatt-class nuclear power plant at an operating rate of 80% over the course of one year generates 70,100 million kWh of electric power, or 25.2 PJ of energy (secondary conversion). The current importation price of fuel coal is approximately ¥400/GJ, and ¥2.5/kWh higher than nuclear fuel. Even if fuel coal prices remain unchanged, power generation costs will increase annually by 17,500 million yen. Kazunari Kainou. RIETI research associate in disciplines of system design engineering and econometrics; IPCC NGGIP ENERGY lead author; CDM executive board member, United Nations Framework Convention on Climate Change; lecturer, Tokyo University Graduate School of Public Policy; research associate, Keio Economic Observatory; advisor, Nuclear Damage Liability Facilitation Fund.